Now that I have become comfortable using Text Lists, I am looking into using Matrixes. I have read the help pages, and have gone over the PanoramaX PDF files covering these subjects. But there is one nagging problem. I cannot produce a header at the top of the matrix. 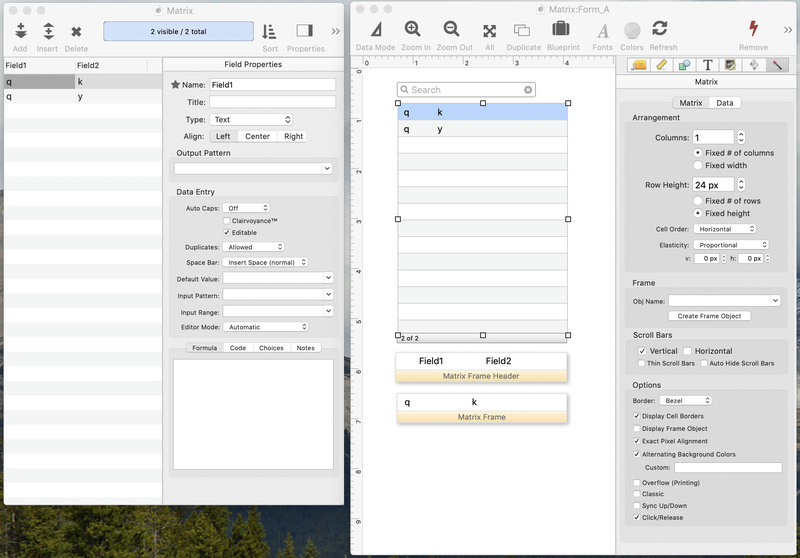 I used Construct List/Matrix to create the basic matrix, selected and copied the Matrix Frame, changed the Matrix Frame name to Matrix Frame Header, and changed the formulas for the columns in the Matrix Name Header to “Field1” and “Field2”. The body of the matrix and the Matrix Frame display the text that I enter into the Data Sheet fields. But there is no Header. I am sure that it is just something simple that I have missed, or that I did something incorrectly, but right now I have no clue as to what it is. Maybe you could post a screen shot of what you’ve done? I have not viewed all of the videos, but I have read the PDF files Panorama X Text Lists & Matrixes, Panorama X Text Lists, and Panorama X Matrixes. Here is a screen shot of the data sheet and the form. There is no other data, or objects, in this database. I think you just want to position the header informstion as text (and optionally other graphics) where you want it to appear above the matrix, not on a different tile. Bruce is correct, it looks like for your application you could just place the headers above the matrix, no Matrix Frame Header is needed. The Matrix Frame Header is only needed if the matrix has a horizontal scroll bar. 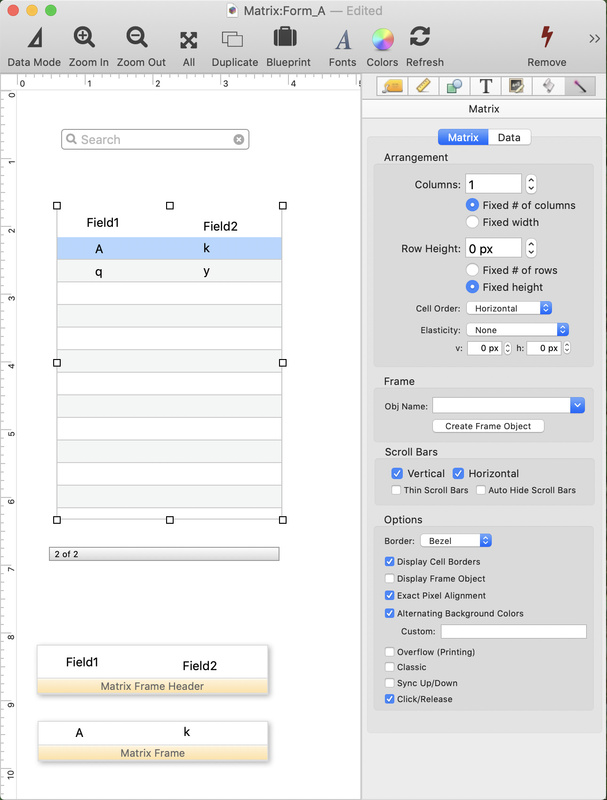 Then using a Matrix Frame Header allows the header to scroll in synchronization with the body of the matrix, as shown in the example on the top of this page. Panorama X: Setting up a custom header for a Matrix Object grid. Even though you don’t need a header, I was still a bit puzzled as to why the header frame wasn’t working for you. It took some sleuthing, but I figured it out. The header only works if the Row Height is set to 0 points (it’s set to 24 points in your example). 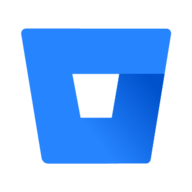 When the Row Height is set to 0 points, Panorama automatically figures out the row height from the Matrix Frame object, and this also enables the option of using a Matrix Frame Header object. If you set the Row Height to zero and refresh, I believe you’ll see the header show up, though you may then decide you don’t really want that feature. It’s pretty understandable that you didn’t figure this out – it doesn’t appear to be documented! I think it is mentioned in the video I pointed out earlier, but it is not in the Help documents (which FYI are not PDF’s, they are HTML). Also, I think the Construct Lists & Matrixes dialog should probably set the row height to 0 points automatically for you. 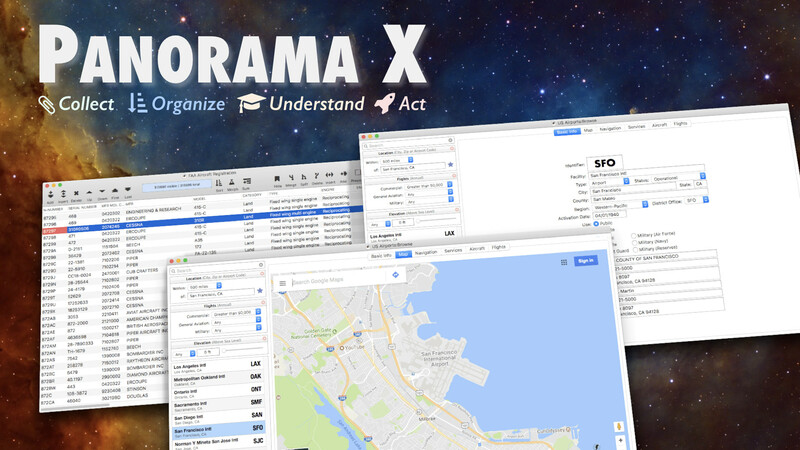 So I have added this to the Panorama X issue tracker. Bruce and Jim, thank you for your help. I now understand better what is going on. First, Jim, I did heed the recommendation you made in your video and in the “Matrix Header and Horizontal Scrolling” help page, that the Row Height should be set to 0 points. However, I did not change the Row Height by typing a zero into the space with the height number, but by clicking on the “less” button next to that space. Using that method, the smallest that number can be reduced to is 1 px, and in doing so the row height is squashed down until all of the rows disappear into a blank matrix object. I even had a go at setting the Row Height in the Blueprint of that object, but it did not like the zero that I typed in and reset the Row Height to 13 px. I did not think to move the Matrix Frame Header to sit on top of the Matrix, mainly because I was under the impression that the actual position of a named Report Tile, such as when it is used in setting up a report to be printed, had no effect on the final appearance of the report. But I tried that after reading your comments, Bruce and Jim. Again, unless I did not do it correctly, I am not a fan of dragging the Matrix Frame Header to the top of the Matrix. It just looks out of place with the lower border of the Report Tile being in view. After typing zero into the Row Height space, or making that space empty, the two sides of the Header appeared immediately, and 0 px. was displayed in that space. So the only question I have about this now is why is the top border of the Header missing? Jim, the PDFs I was referring to are collections of the slides that you presented in your training videos. A year or so ago I downloaded these files (sixteen of them) from one of the pages on your Web site. I have gone through most of these files several times since then, and they have been very helpful. At that time, I also downloaded PDF files of six of the Panorama 6 books that you made, and I use them for reference as well. No, that’s not what we meant. We were saying to just get rid of the Matrix Frame Header, and simply place it’s contents above the Matrix object. But now that you’ve got it working, that’s fine too. That’s because the ability to set it to zero to follow the frame height was a feature that was added later, and I forgot to adjust the stepper to a minimum of zero. I’ve added that to the bug report. So the only question I have about this now is why is the top border of the Header missing? Looks like that is another bug. I think the background color (which defaults to white) is overwriting the border. I usually use a dark background color so I never noticed that before. If you set the border to Line instead of Bezel it does work, but that doesn’t look very attractive in my opinion. I have added this to the bug report as well. Gotcha – I’m glad you find them helpful. Jim, that information is very helpful. I will play around with the settings for the Matrix some more and observe the difference they make.